Debug access to all memories and registers in the system, including Cortex-M4 register bank when the core is running, halted, or held in reset. Serial Wire Debug Port (SW-DP) and Serial Wire JTAG Debug Port (SWJ-DP) debug access. Flash Patch and Breakpoint (FPB) unit for implementing breakpoints and code patches. Data Watchpoint and Trace (DWT) unit for implementing watchpoints, data tracing, and system profiling. Instrumentation Trace Macrocell (ITM) for support of printf style debugging. IEEE1149.1 JTAG Boundary-scan on all digital pins. Integrated in the Atmel Studio IDE with a graphical user interface or available as standalone for GCC, IAR compilers. 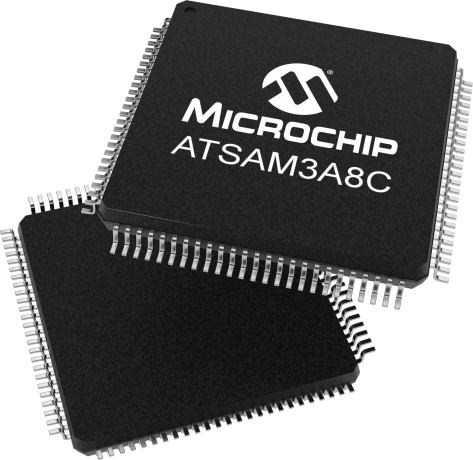 Based on the ARM® Cortex®-M3 processor, the Microchip's SAM3A8C runs at 84MHz and features 512KB of flash memory in 2 x 256KB banks and 96KB of SRAM in 64KB +32KB banks. Its highly-integrated peripheral set includes dual CAN, High Speed USB MiniHost and device with on-chip PHY, high-speed SD/SDIO/MMC, and multiple USARTs, SPIs, TWIs (I2C), and one I2S. The SAM3A8C also features a 12-bit ADC/DAC, temperature sensor, 32-bit timers, PWM timer and RTC. It supports the Microchip QTouch Library for easy implementation of buttons, sliders and wheels. The device operates from 1.62V to 3.6V and is available in 100-pin QFP and BGA packages. Power Debugger is a powerful development tool for debugging and programming AVR microcontrollers using UPDI, JTAG, PDI, debugWIRE, aWire, TPI or SPI target interfaces and ARM® Cortex®-M based SAM microcontrollers using JTAG or SWD target interfaces.